Just off an unnamed road, at coordinates 28⁰4’28” N and 84⁰7’5” (give or take a degree), there’s an energy in the air. It’s electric and moves with a strength that echoes through the sequestered foothills and jungles northwest of Shuklagandaki, Nepal. 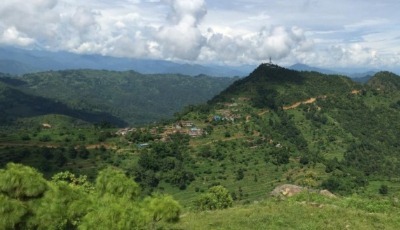 The spectacular green hills in this area mixed with agriculture and peaceful, charming villages are a trekkers’ paradise. The energy does not come from the radio tower that’s on top of the nearest peak. It’s generated by 50 like-minded women in the village of Dagam with a common belief, objective, and understanding. They’ve gathered together in their small community center to welcome us and to tell their story. They have common backgrounds filled with bruises and scars. They’ve had difficulties providing for their family. They’ve had to face their children during Dashain, considered the biggest Hindu festival, and tell them they won’t be receiving any gifts this year—a moment that still brings tears to their motherly eyes. They’ve sent their children to school with tattered clothes and no supplies. They’ve had to watch helplessly as their children suffer through a sickness with no money to purchase medicine that could bring relief. They’ve been rejected by banks again and again because to the bank they had no capital and no way to repay back any loan, no matter the amount. The bank labeled them as broke and broken. Women around the world have much less access to fair and affordable credit for their basic needs or business. While 46% of men around the world report having access to formal financial services, only 27% of women have access. 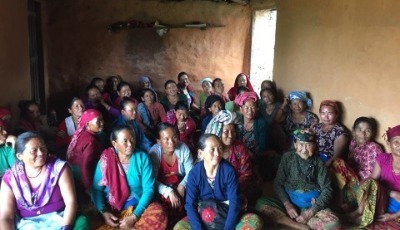 But for the Khairenitar Women’s Cooperative in Shuklagandaki, these women are glorious and are the key to creating a systematic change within the community. Every woman in the village of Dagam is part of this cooperative where they can receive microfinance loans based on who they are as women and mothers, what’s called social capital, to help them achieve a better life. On August 18, they came together to show us just how strong they are. After one interview with cooperative member Nirmala Thapa, I could see it. She once struggled raising and selling 5 chickens. After receiving and paying back multiple loans from the co-operative, she now raises 300 chickens for profitable resale. She uses the loans to help her purchase food for the chickens and other maintenance needs. She uses the profit to pay back the loan and to support her children through school. Then after the second interview with 81-year-old Sovarna Renamagar, who is now supporting her grandchildren through school, an important truth filled me: empowerment comes in the numbers but helps people individually. In the numbers because female empowerment in rural Nepal means stronger families and a stronger village. It means an entire population can have their basic needs met and then flourish. While the loans are given to individuals, the women here help with each other’s farms from hand tilling, planting, watering, maintaining, and harvesting. They pay each other $2 USD a day for the help. Make no mistake, it’s incredibly hard work. Almost crazy work that would exhaust the average American. It would definitely break my back in several places. But these women are strong and in it together. Together, with heavy baskets on their heads, they walk down a windy, rocky road—a road our 4x4 SUV got stuck in—for 3 hours to the nearest marketplace where they sell their vegetables, honey, milk, and chicken and goats for a fair price before making the long journey back home, climbing over 2,000 feet in the process. They make this journey 3 times a month. Individually, they feel empowered and have more confidence and self-esteem than ever before. They are no longer afraid to speak up in a meeting. They are no longer dependent on their husband’s unsteady work flow. They can contribute and provide stability to the home like never before. To be clear, enterprise, promotion, titles, possessions, and bigger houses are not driving them. They don’t see themselves as founders and CEOs of their own business—a foreign concept they don’t understand or really care for. 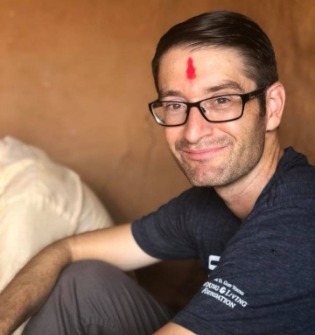 They are simply working hard so they can send their children to better schools and college, making sure they have the uniforms and the school supplies they need. They are working hard to purchase medicine when their children get sick. And, of course, having the means to purchase gifts during the Hindu festivals. Seeing their children happy is their happiness. There is nothing more powerful than that of a mother wanting to improve their child’s future and the power of women coming together to do the same reaches far beyond what my small mind can imagine. Yes, empowerment is important for every human being regardless of gender, ethnicity, or religion. We all deserve to live a life that we choose and according to the terms that are right for us. But for woman in these hills, where they are often the most consistent bread winner, empowerment is everything. This is what it means to not allow social norms, rules, and other people’s expectations to govern you or your life. To me, these women stand taller than any portion of the Himalayan mountain range because of the values and priorities they have. Priorities centered on working hard for family and selflessly setting aside their needs for the village. This is clearly a definition of brave.